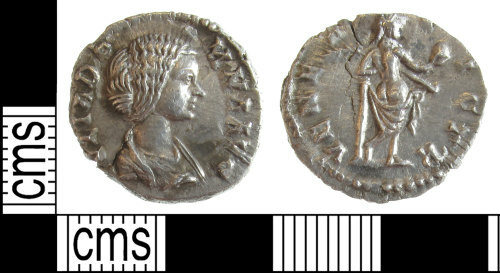 A Roman silver denarius of Julia Domna (AD 193 - 217) dating to c. AD 193-196, Reece period 10. VENERI VICTR. reverse type depicting Venus, naked to the waist, standing right, holding apple and palm and resting left elbow on column. Mint of Rome. RIC IV part I, page 165, number 536. Reverse description: Venus naked to the waist, standing right, holding apple and palm, resting left, elbow on column. RIC : RIC IV part I, page 165, number 536.